The essential takeaway from the editorial seems to be that Gov. Deval Patrick’s competence has not matched his inspirational rhetoric, and that Martha Coakley offers a lot less inspiration with no promise of greater competence. 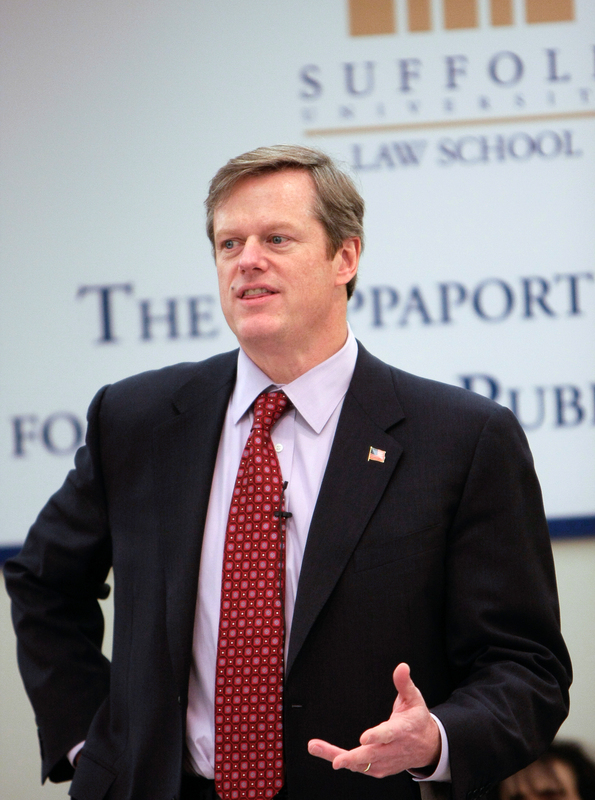 Baker is no liberal, but he’s just liberal enough — especially on social issues — to get the nod. How important is the Globe’s endorsement? It’s hard to say. I don’t think people look to newspaper endorsements to decide whom to support in high-profile races like governor or U.S. senator. Endorsements are more valuable when the candidates and offices are obscure, and voters are genuinely looking for guidance. But the race has been moving Baker’s way during the past week or so. Even if you discount the Globe’s poll last Thursday showing Baker with a 9-point lead, the trend is clear, as this WBUR Radio graph shows. Right after the primaries I predicted that Baker would win, and that it wouldn’t be particularly close. Let’s put it this way: The Globe’s endorsement of Baker may not be fatal to Coakley’s chances, but it certainly doesn’t help. Photo (cc) by the Rappaport Center for Law and Public Service and published under a Creative Commons license. Some rights reserved. What penalties does Baker face if found guilty of bribing NJ Gov Christie to choose Baker’s company to manage NJ pension money? I plan to vote for Baker despite the Globe endorsement. I only wish that we hand’t melded the Gov. and Lt. Gov. posts after the Volpe/Bellotti debacle. I’d like to vote for Tracy Post for LG as well. I’m very late to the party here, Dan, on this topic. But I think the Globe really telegraphed its intentions on Baker in the language of its primary election endorsements.The choice of Baker then was actually less relevant as to the prediction. It was the forceful endorsement of Grossman – and what seemed like a tone of anti- or anyone but- Coakley – that I felt foreshadowed the Baker endorsement. Thanks for the history lesson also. I had wondered what they did on Sergeant but didn’t know. WHo do you think made this decision? The ed page editor is on an interim basis, I think. Her? John Henry? I doubt it was a consensus pick among the whole board, but I can’t say for sure since the board is surely expanding and evolving over the last 8 years. @Michael: There’s a long history of the Globe liking moderate Republicans such as Baker. That said, it’s John Henry’s paper. So who knows? Thanks for the response Dan (and sorry for double posting, I was thrown off by a login queue that said my e-mail is attached to a WordPress account). I am a bit younger than you, so I am less familiar with the endorsements the Globe made back in the 80s and 90s, but I suppose it does make sense that they would endorse the occasional Republican candidate. As liberal as the Globe has been over the years, the same can be said, broadly speaking, about the population in general. Yet, Republicans have been winning the gov election the majority of the time. Deval Patrick is something of an outlier. In the national media, pundits like Rachel Maddow and some Fox News types seemed stunned by a GOP win in Mass. But, MSNBC’s Steve Kornacki, who has roots in the state, made sure to inform them that the state often does elect Republicans to “chaperone” (his words) the Democratic-led Legislature. Who do you think made this decision – -the interim ed page editor, or the publisher? I doubt it is the consensus of the board, but hard to say.